The Dilemma of Informal Economies: Why Should Cities Take It Seriously? In urban areas with rapidly growing populations or inward movement, the informal economy tends to absorb most of the expanding labor force. Data released by International Labor Organization (ILO) stated that by 2015 the explosive growth of many Asian countries’ urban populations and the increase in service-sector employment will combine to significantly expand the urban informal economy. Other research by World Bank in 2016, showed that the informal sector comprised more than 50% of the urban economy in developing countries such as Laos, Viet Nam, Myanmar and Cambodia. While the informal sector contributes a lot to countries’ GDP, most informal employees in this sector are vulnerable. Often they have informal work agreements and also often get low wages and poor working conditions which may undermine the fundamental rights of workers. This month, we discussed the informal economy, its contribution and consequences, with Sarah Reed from the Women in Informal Employment: Globalizing and Organizing (WIEGO). Sarah is a Focal City Coordinator for Bangkok. Before joining WIEGO she advised programs for the United Nations Development Program (UNDP), the Institute for Social and Environmental Transition (ISET), the Asia Foundation, and CARE. Understanding the complexities of the informal economy has been difficult because of the lack of information and data about it. In some cases, it is common that the informal economy data are simply ignored. How do you view this? It’s actually a common misconception that we lack data on it. National Statistical Offices are increasingly collecting these statistics through their labor force surveys. That’s why we know, for example, that informal employment comprises 82% of all non-agricultural employment in South Asia and 66% in East and Southeast Asia (excluding China). In India, it contributes 46% of all non-agricultural Gross Value Added (GVA). In some cases, we can get this kind of data down to the municipal level. Informal workers comprise almost 30% of the workforce in the Bangkok Metropolitan Authority area in Thailand. Because of changes to the Labor Force Survey next year that specify place of work and status in employment, we’ll also know much more about these workers’ specific professions and relationships with their employers. We need more of this kind of information to inform more appropriate policy and planning. There are many gaps in information as well, however. Most cities do not have municipal level data from national labor force surveys. Even for cities like Bangkok, we know very little about the number of undocumented migrant workers, who are among the most vulnerable workers. From a resilience perspective, it’s clear that informal workers are vital to urban systems by providing services like transportation, care, food services, and waste management. But there aren’t many studies that quantify this contribution in monetary or other terms. Nor do we evaluate the consequences of disruption to informal services during a disaster, or assess what role those informal service providers play in mitigating them. 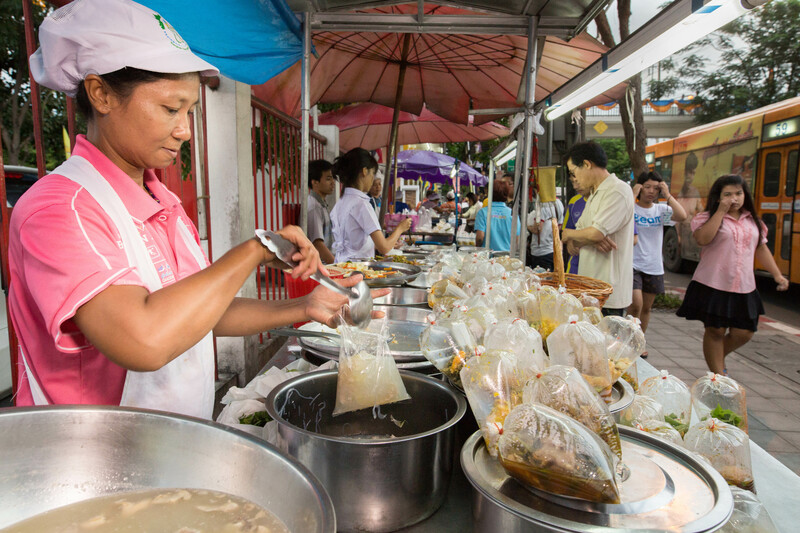 What does it mean for the resilience of Bangkok if the city succeeds in its current campaign to severely reduce the number of street vendors? These kinds of questions should be the subject of research for the urban resilience community. Findings show that informal economy workers are most likely to be systematically marginalized from access to security and services within the city, whereas they are among those most at risk. Is there any success story to involve them in resilience practice according to your experiences? There are many good examples of how governments, cooperatives, or other member-based organizations (MBOs) of informal workers have started providing services, through channels designed to meet their specific needs. The challenge in all of this is how to design services and schemes in ways that are accessible to informal workers, at hours they are available and with contributions (if any) that they can afford. The Self-Employed Women’s Association (SEWA) in India has established Shakti Kendras worker facilitation centers that connect workers to existing government entitlements like social security, health and nutrition programs. They also provide basic health diagnostic assessments and referrals to health facilities. Importantly, the centers operate during hours that informal workers can attend without losing their daily income. In 2014, the government in Thailand launched a national social security scheme for informal workers. The scheme’s benefits are more limited compared to those of formal workers, and many informal workers lack awareness of the program. Yet it’s an important step for the government to recognize that it has a responsibility to facilitate access to social protection, and for workers to demand their right to it. The growing negative stereotypes of informal economies have resulted in disadvantageous treatment, especially of women. Evidence also suggests that women are often concentrated in the lowest-earning parts of the informal economy. Based on your experience, what would be the best way to advocate women’ rights in order to catalyze inclusive resilience? What are some of the challenges that you face when trying to do this? It’s true that informal workers face considerable stigmas, including the misperception that their work is in some way illegal or illegitimate. For all informal workers, but for women in particular, they are frequently not recognized as workers at all. For instance, home-based workers (who are predominantly women) are seen as earning supplemental household income by producing goods in their homes, though in reality they are frequently an important if not the primary breadwinners. Employers of domestic workers often view them as “family members,” expected to meet their responsibilities or work long hours out of a sense of familial duty rather than on the basis of mutually-agreed labor contracts. These prejudices against female workers emerge even in professions where men and women work side-by-side. Because they bear the brunt of care and reproductive responsibilities, lack of adequate health care, child and elderly care facilities, and maternity benefits have a heavier impact on women than men. Taken together, these social stigmas and socioeconomic realities make women workers particularly vulnerable to exploitation and crises. These are obviously “wicked” problems requiring transformative change. We seek to address these issues by enhancing the voice, validity, and visibility of the work poor, particularly of women, in the informal economy. “Voice” in particular is about the building of democratic member-based organizations (MBOs) to represent the needs of workers. In a recent article, my colleagues analyze how organizing and the process of “claim making” by women workers can help mitigate gender inequalities among informal workers. We need to make sure that these claims are also reaching governments, influencing legal frameworks, law enforcement authorities, and the public at large. Indeed, it’s a long struggle. Lastly, how do you think we should move forward with the the inclusive resilience agenda in the Asia region? It’s very encouraging that resilience is a ubiquitous theme in the Post-2030 Agenda for Sustainable Development, including the SDGs, the New Urban Agenda, and the Sendai Framework. On the other hand, resilience is a notoriously slippery concept and means different things to different people. As we leverage these agreements, we have to be careful that resilience doesn’t get framed as a purely technical issue. Resilience is about distribution of benefits and risks in a system. There’s nothing inherent about resilience that makes it inclusive or fair unless people demand it to be so. Organized labor movements— whether of formal or informal workers – already work towards a more just distribution of benefits and risks in society. Informal workers are normally on the frontlines of natural and economic crises in their cities and they understand from firsthand experience the impacts of floods, storms, earthquakes, etc. Along with community organizations from informal settlements, organized labor is a natural ally in the push for inclusive resilience. The resilience agenda needs to be mindful of the important role the informal economy plays and how inclusive approaches to informality can enhance resilience. The informal is ‘normal’ - it is here to stay. It plays a key role in employment generation and poverty alleviation. Segments within it like waste pickers play a key role in climate change mitigation and the carbon footprint of other groups like street vendors are often smaller than their formal economy counterparts. There needs to be greater acknowledgement of these realities in resilience practice. Sarah Reed and her colleagues have recently published a study on informal workers in Bangkok, which examines livelihood barriers, access to services like health care and housing, and relationship with urban institutions among street vendors, domestic workers, home-based workers, and motorcycle taxi drivers. WIEGO’s Informal Economy Monitoring Study (IEMS) examines informal livelihoods in ten cities in Africa, Asia, and Latin America, focusing on home-based workers, street vendors, and waste pickers. It’s a very important resource for anyone trying to get their head around the informal economy in cities. Read more about the informal economy and workers in the informal economy on the WIEGO website and blog. What's the problem about this node? please login first to report a content. Copyright © 2008 - 2019 ACCCRN Network. All Rights Reserved. Page generated in 0.33 seconds.